Oracle Home. To attach a database, apply log files (if required) and make a consistency check of the database. Current restore point analysis. To search for available Oracle databases within the selected restore point only. Extended analysis. To search for available Oracle databases within multiple restore points. 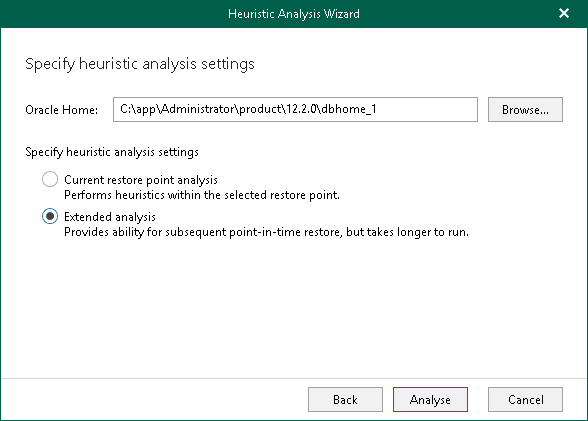 Typically, Veeam scans three restore points; the current restore point, which you select when opening Veeam Explorer, and two other restore points that come before and after the current restore point. Once analysis is complete, Veeam will load available Oracle databases to the program scope automatically.